No union? You still have rights at work. Joining a union and bargaining a collective agreement is the best way to win new rights and protections at work. But even if you are in a non-union workplace, you are entitled to many basic rights that cover issues like hours of work, vacation, health and safety, personal privacy and joining a union. 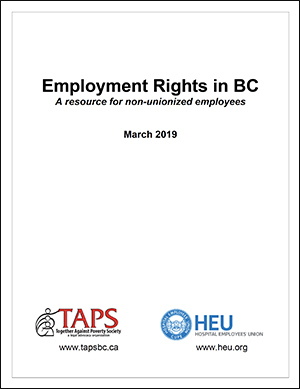 Employment Rights in BC: A resource for non-unionized employees is a project of the Together Against Poverty Society and the Hospital Employees’ Union. It provides a simplified statement of employment rights for workers in British Columbia who aren’t in a union and not covered by a collective agreement. We have just updated the resource guides in March 2019. Employment Rights in BC is also available in Punjabi and Filipino. It covers the rights of employees in British Columbia set out in the Employment Standards Act, Human Rights Code, Labour Relations Code, Workers Compensation Act and Personal Information Protection Act. This document is intended to educate non-union workers about their rights in the workplace. Please feel free to distribute it widely. But remember – this document can’t cover all possible situations you may face at work – and is not a substitute for legal advice. If you think you need more help, talk to an advocate or a lawyer.